Based on clinical manifestation and biochemical studies, these disorders have been classified as Hurlers' syndrome (MPS I), Hunter' syndrome (MPS II), Sanfilippo's syndrome (MPS III), and Morquio's disease (MPS IV). All subtypes of MPS occur as progressive autosomal recessive trait except Hunter syndrome which is X-linked. The present study emphasizes on the subtypes of MPS IV. The main characteristics which distinguishes Morquio syndrome (MPS IV) from all other subtypes of MPS is normal intelligence. To distinguish Morquio syndrome with other type of MPS is clinical and biochemical features of this condition, which results in permanent, progressive cellular damage that affects appearance, physical abilities, and organ system functioning. However, there is no reported literature mentioning about specific hearing deficit in this particular type of MPS, that the present study has noted. The rate at which symptoms worsen, varies among affected individuals. Since it is a rare pathology, with multisystem damages, it may have eluded the researchers or clinicians from identifying it with progressive conductive or mixed hearing loss. Case reports are positive steps in this direction and hence this study aims at reporting the audiological outcomes in two siblings with Morquio syndrome. The present study evaluated two individuals (case A: 18-year-old male and case B: 15-year-old female) with a complaint of sudden, persistent, and progressive conductive pathology in both the ears. A structured detailed case history was taken for case A and B. There were no complaints of dizziness or tinnitus in both cases as reported. Both the cases are siblings (brother and sister), and were diagnosed as having MPS type IV by the professional Geneticist. First of all, otoscopic examination was performed for case A and B by otolaryngologist. During otoscopic examination of case A, they observed removal of grommet in situ in right ear and presence of fluid in left ear. Further, the tuning fork test showed Rinne negative in both ears. While case B showed normal tympanic membrane in right ear and grade I retraction of tympanic membrane in left ear. However, tuning fork test could not be performed for case B. Both the clients underwent a routine audiological evaluation that included pure tone audiometry and speech audiometry using Madsen Orbiter OB 922 version 2 diagnostic audiometer, and immittance evaluation using GSI Tympstar diagnostic immittance meter. 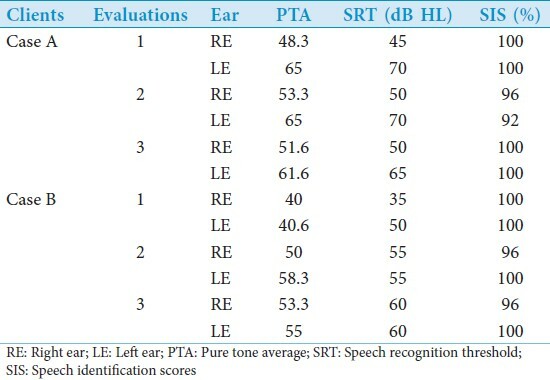 Conventional pure tone audiometry was performed using the modified Hughson-Westlake procedure. Air conduction and bone conduction thresholds obtained at octave frequencies from 250 to 8,000 Hz and 250 to 4,000 Hz; respectively. Pure tone average was calculated using air conduction thresholds obtained at 500; 1,000; and 2,000 Hz frequencies. Speech recognition threshold (SRT), speech identification score (SIS), and uncomfortable level (UCL) was evaluated for both clients. SRT testing was done using spondee word lists and SIS was estimated using phonemically balanced monosyllable word lists. Tympanometry and acoustics reflex thresholds were obtained using a calibrated GSI-Tympstar diagnostic immittance Middle Ear Analyzer. Tympanometry was performed bilaterally using 226-Hz probe tones, and measurements of ipsilateral and contralateral acoustic reflex thresholds up to 110 dB were attempted at 250; 500; 1,000; 2,000; and 4,000 Hz. Case A (18-year-old male) presented with the complaint of reduced hearing sensitivity along with pain in both the ears (right ear is reported to be better). As reported, there was a sudden onset (progressive in nature) of the problem at 16 years of age. Three audiological evaluations were carried over time [Table 1] and [Table 2]. 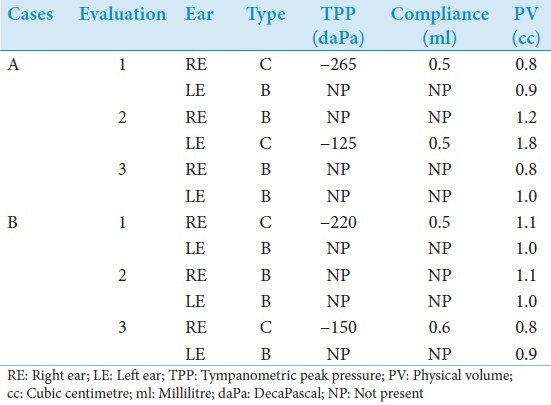 First evaluation results revealed moderate mixed hearing loss with "C" type tympanogram in right ear and moderately-severe mixed hearing loss with "B" type tympanogram in left ear, along with absent acoustic reflexes (ipsilateral as well as contralateral) in both the ears at the limits of testing apparatus. Second evaluation was carried out after 8 months of previous evaluation, which revealed similar degree and type of hearing loss in both the ears. However, immittance evaluation results showed "B" type tympanogram in right ear and "C" type tympanogram in left ear with absent acoustic reflexes (ipsilateral as well as contralateral) in both the ears. After 1 year 3 months, third evaluation was carried out, the findings revealed similar degree and type of hearing loss with bilateral "B" type tympanogram with absent acoustic reflexes. Hence, there was no progression in severity of hearing loss seen in case A; but, it was reported by the client [Table 1] and [Table 2]. Case B (16-year-old female) presented with the complaint of reduced hearing sensitivity (right ear is reported to be better) along with blocking sensation in right ear. As reported, there was a sudden onset of problem that started at the age of 14 years. Three audiological evaluations were carried over time [Table 1] and [Table 2]. First evaluation results revealed mild conductive hearing loss with "C" type tympanogram in right ear and moderate conductive hearing loss with "B" type tympanogram in left ear, along with absent acoustic reflexes (ipsilateral as well as contralateral) in both the ears. Second evaluation was carried out after 1 year of previous evaluation, which revealed moderate mixed (gradually sloping) hearing loss in right ear and moderately severe (gradually sloping) mixed hearing loss in left ear with "B" type tympanogram along with absent acoustic reflexes (ipsilateral as well as contralateral) in both the ears. Third evaluation was carried out after 1 year 7 months of the second evaluation, revealing bilateral moderate mixed hearing loss with "C" type tympanogram in right ear and "B" type tympanogram in left ear with absent acoustic reflexes. Presently, both the clients are using moderate gain behind the ear (BTE) digital hearing aid in both the ears which is enabling them to communicate better. Both cases are very good in their academics and pursuing Bachelor in Engineering (BE). The MPS share many clinical features, but have varying degrees of severity. Finally, it is important to remember the genetic nature of disease and possibility of prenatal diagnosis in subsequent pregnancies. Since study has reported the condition to occur among siblings, this insists the importance of prenatal genetic counseling for all pregnant mothers. The present report outlines persistent conductive or mixed hearing loss found in two siblings with Morquio syndrome which is reported as a progressive condition with multiple organ and tissue involvement. The conductive component may be attributable to serous otitis media secondary to dysfunction of the auditory tube and chronic thickening of the mucosa of middle ear. The cause of sensorineural involvement is unknown, but has been attributed to abnormal metabolism within neural element. In a similar line, study showed conductive hearing loss in three patients under the age of 8 years, but 14 out of 15 older patients had either mixed or sensorineural hearing loss. The data concerning the frequency of hearing loss in the MPS are probably unreliable; it could be because of other associated factors, lack of cooperation, and early death. Many case reports do not mention that hearing loss could be because of either not marked early or minimal deficit is noticed. Documentation is required as it is a late onset condition. Although most cases of Morquio syndrome are detected early by other medical specialist, an increased awareness of the condition may lead to involvement of audiologist in the diagnosis as early as possible and providing immediate management. To conclude on these case reports of the siblings, audiologist and speech language pathologist need to be aware of this relevant information and take immediate steps to provide services to patients. Regular follow-up of the clients is an important aspect, as it is highlighted in present study. We would like to thank the Director and HOD Audiology for granting permission to carry out the study. We would also like to thank both clients for their participation and kind cooperation throughout the course of the study. 1. Rekka P, Rathna PV, Jagadeesh S, Seshadri S. Mucopolysaccharidoses type IV A (Morquio syndrome): A case series of three siblings. J Indian Soc Pedod Prev Dent 2012;30:66-9. 2. Sataloff RT, Schiebel BR, Spiegel JR. Morquio's syndrome. Am J Otol 1987;8:443-9. 3. Carhart R, Jerger JF. Preferred method for clinical determination of pure-tone thresholds. J Speech Hear Dis 1959;24:330-45. 4. ANSI. Maximum permissible ambient noise for audiometric test rooms. ANSI, S3.1, New York: American National Standard Institute Inc; 1991. 5. Riedner ED, Levin LS. Hearing patterns in Morquio's syndrome (mucopolysaccharidosis IV). Arch Otolaryngol 1977;103:518‑20.